To your heart, your dream and the difference you make. Today, express your faith and confidence in someone close to you. Give the gift that says, 'I Belieive In You', just four little words but their impact is powerful. One month of daily inspiration encased in a beautifully presented gift satchel. 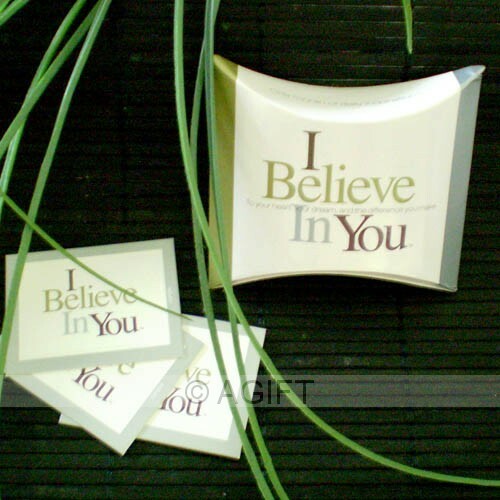 Each card opens to reveal an inspiring message of support and encouragement. 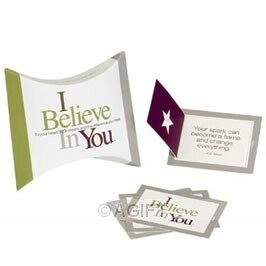 These are the original Little Window Message Cards that have inspired more than 150 million people throughout the world. Share these little cards with friends, family, co-workers or customers, or give the whole satchel of 30 cards away as a gift. The gift of inspiration is among the most significant and far reaching gifts we can give the world.